Thank you to Evereve and Hudson denim for outfitting me for this post! Well friends, I did it. I got my first “big girl” pairs of denim! Let me just say, I can see what the hype is all about. I am hooked! I’ve come to the conclusion that we all need an amazing pair of denim. It’s something that will be a staple in your wardrobe! For today’s post, I’m styling two pairs of Hudson denim from my favorite store – Evereve! 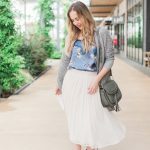 I put together two looks that I felt were totally applicable for many of us – a casual weekend look, and a moms’ night out. I just love how these jeans can be dressed up or down, and are such a versatile piece! If you’re thinking about buying a “big girl” pair of denim, make sure you check out the Evereve Denim sale! It runs through tomorrow, January 21. Every denim piece is 15% off! I absolutely love this look because it makes me look like a “cool mom.” Usually, when I think of the best way to wear jeans, it’s a casual look that feels effortless but looks great. I’m wearing basics, but they’re styled in an on-trend way (or so I’m told, haha)! I love the pop of pink with the tennis shoes, too! This is seriously my new favorite casual mom look. I absolutely love this look paired with my Hudson Denim! It’s the perfect Moms’ Night Out look with the right amount of glam. I always love a great pair of denim dressed up. Pair it with a beautiful blouse, statement booties, and a bold lip – you’re good to go! I love how polished, put together, and glam this look is! Also great for date night. What is your favorite way to wear denim? I can’t decide which look I love more! Don’t forget to check out the Evereve Denim Sale! All photos by Kate Carmichael Photography. So cute! What size did you buy in the Harlow Jacket? Does it run small? It looks really great on you and so comfortable.